Going into this year I set myself some clear goals that directly relate to creativity and productivity. For the past two months my goals have been my compass every time I step into the studio and ask myself the question, ‘what now?’. To be honest, I am still getting comfortable with my goals. There is nothing ‘earth-shattering’ about them; they are probably not all that different from goals you have set yourself – but I am fully aware that alongside any new goal comes the need to cultivate new habits – and those new habits take time and awareness to fortify! I am still exploring what works for me, but I am putting in the effort to be more intentional with my creative work, and I am starting to find myself less distracted and more prepared to focus. I worked on 4 WIPs in the past two months. Scrappy Red, White & Blue Trip Around the World. Tutorial found here. Great inspiration found here. It was Alli of Woodberry Way’s original version that made me fall in love with this pattern, and she has made a number of gorgeous versions since then. The first time Alli posted a glimpse of her quilt I started putting fabric aside for my quilt in true ‘scrap’ fashion, but it has taken me quite a while to get enough strips to begin to piece the blocks. 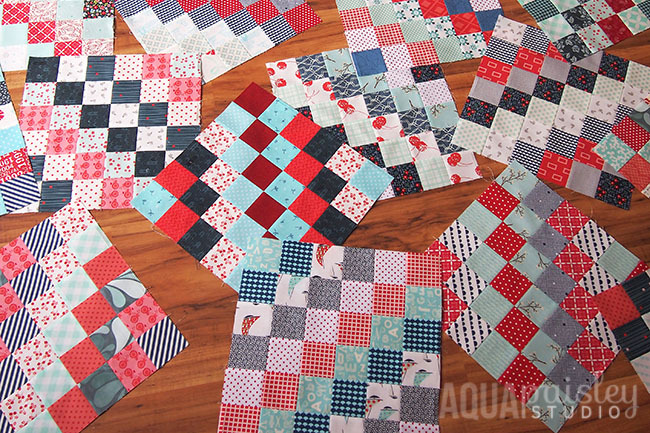 I want to make one big enough to use as a picnic quilt, and so far I have about half the blocks pieced I think I will need – but I am currently out of the right sort of scraps. So until I have collected more scrappy strips, I have taken this project as far as I can go. 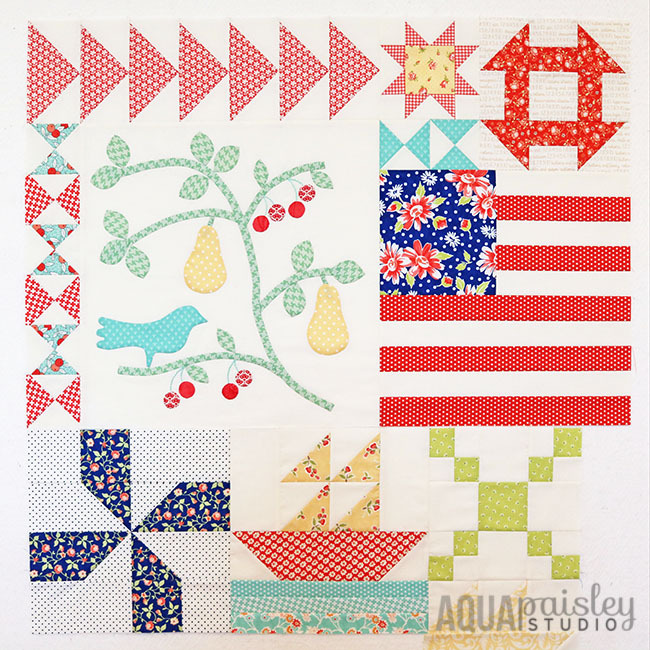 Austin Bluebird Sampler, using Fig Tree fabrics. Pattern by Minick and Simpson. I love this pattern, but I think I may be over analysing my fabric choices a little too much. This was always intended to be a long term project, so I am happy with making minor progress. 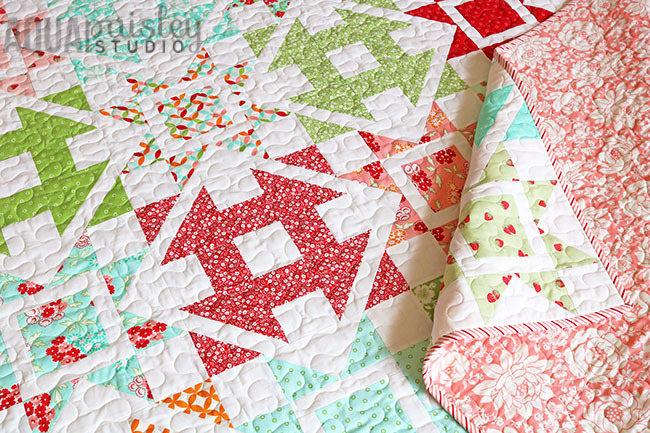 Dashing Quilt, using Hello Darling fabric by Bonnie & Camille. Pattern by Coriander Quilts. From memory I pieced this pattern at the very end of 2015, but I never got around to finishing it because I was unsure how to quilt it, and would have really loved to have it professionally quilted. Since I had the backing, batting and binding ready to go, I stopped over-thinking it and dreaming about what ‘might be’ and set about quilting it with an all over meandering stitch. 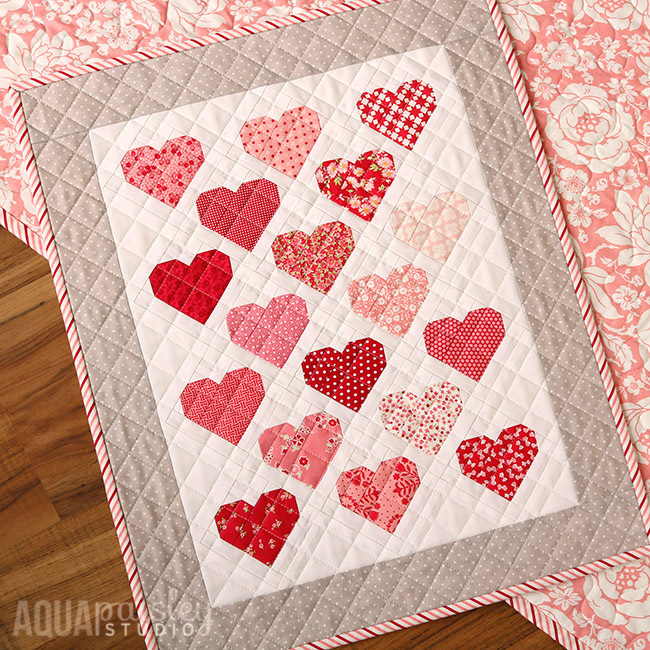 Even though there were a couple of little quilting hiccups – I think it has turned out beautifully! I need to remember I have never met a meandered quilt I didn’t like, and just quilt my tops the best I can right now ;). Going Places, using Little Miss Sunshine by Lella Boutique. I was SO close to having this top completely pieced before the end of the month, but I was offered the opportunity to sew with a gorgeous soon to be released fabric range, and the distraction (which was very welcome) meant that I didn’t have the time to sew the final borders onto the quilt. But, I will! Soon!! Down Memory Lane Mini – Released in February. Celebration Cake – Officially released this week, but pattern completed in February. No new sewing techniques attempted, and I haven’t read anything informative recently that comes to mind, but I have been trying to ‘wrap my head around’ Adobe Illustrator! I have manged to illustrate some graphics for my patterns using it, and am slowly finding my way around the software; but because I am used to ‘drawing’ using software designed for pinpoint accuracy (when drafting renovation plans for the construction industry), I find the lack of stroke accuracy in Illustrator leaves me frustrated! It is most likely that I don’t know enough about the software to ‘fix’ the problem, and no amount of Google searching has been able to shed light on the exact issue. But, I am hanging in there and working towards understanding the software a little better each time I use it. I posted 6 times between Jan and Feb. I shared 2 tutorials, a new pattern, and wrote about my 2017 goals and establishing creative habits in more depth. I also sent out exclusive content in my first newsletter, which shared some of my favourite tips and gave subscribers access to a pre-release pattern launch and great discounts. The newsletter is definitely a work in progress, but I did receive some great feedback from subscribers – which was great to hear! I am actually really proud of the fact that I have been a little more ‘present’ with my blog, and have been able to share more about what truly does go on behind the scenes in my mind and in my studio. 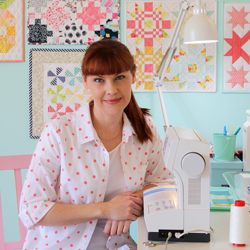 I recently heard a sewlebrity say it takes her approximately 15 minutes to compose and write a blog post – and let’s just say that if you could have seen my expression at the time you would have found it comical!! All I will say is that it takes me a wee bit longer to put my thoughts into words…yep, just a wee bit, and then a wee bit more!! So I am patting myself on the back for almost weekly posts – and if anyone asks, I am all about quality over quantity ;). 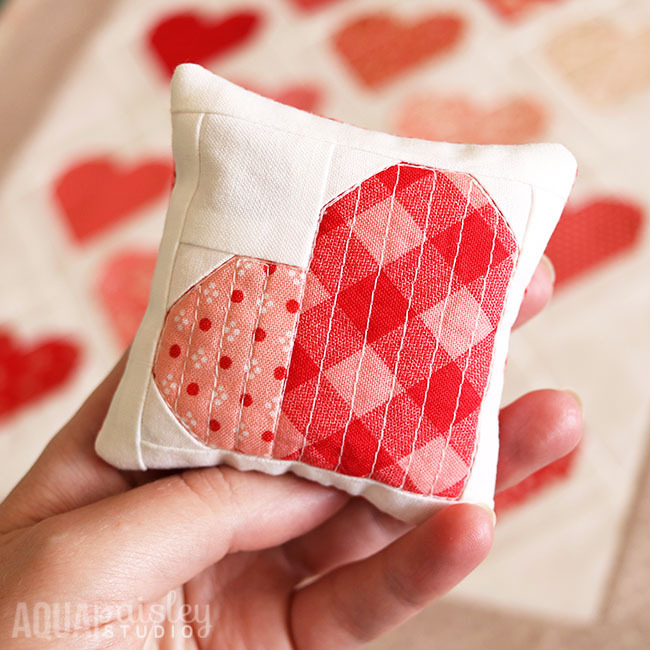 My scheduled sabbatical this time around came at a slightly less than ideal time, as I was in the middle of launching my Down Memory Lane Mini pattern in time for Valentine’s Day. This meant I wasn’t as ‘switched off’ as I would have liked to have been. But even so, I found that stepping away from the saturation of social media for just a few days had a way of cleansing my mind and helping me refocus on what was important to me. Hitting the pause button, even for a moment helps to bring a sense of peace and focus to my life. 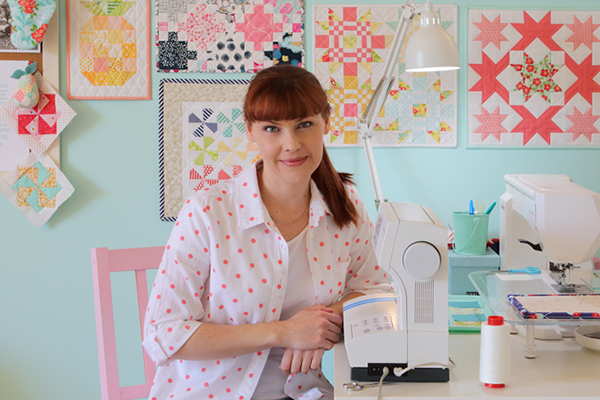 Whether you define success as piecing a block, finishing a quilt or maybe a whole series of quilts, it is important to come to the realisation that being creatively successful is no accident – but it is you who determines the definition of success! Working toward your goals and accomplishing your dreams is no accident either, you must be intentional and have clear objectives in order to make things happen. It is important to know what it is you want to achieve, AND why you want to achieve it. Only when you are able to answer these questions relative to your own circumstances will you be able to feel the greatest sense of accomplishment and celebrate your creative endeavours. Do what it is you need to do to stay aligned with your goals, as long as they are still serving you and ultimately bringing you joy! What is my ultimate goal for 2017? What habits do I need to improve or remove from my life? What do I want my everyday life to be like? How do my creative goals impact my everyday life? Creative goals are great, but you do have to put them in perspective! Even after two short months I can see how being focused on some goals has meant sacrificing goals in other areas of my life. Sometimes in order to be truly happy and successful you need to work towards creating a better blend of goals in order to create harmony across all the areas of your life – and that’s OK! How are you travelling with your own creative goals? Are you feeling the motivation dip, or are you more dedicated than ever to create with intention? Thanks for the tutorial on jelly roll measuring/trimming, I always wondered if I needed to trim the strips. I’ve refused to trim in the past out of stubbornness, the whole reason I buy them is so I don’t have to cut. I’m in love with the paint color on your wall! Do you know the name?